Oh, we can’t let Emma see that, she’d be hooked in an instant. Mick shot back: I’ll meet her at bacon camp! Mary said: I’m sure Grubbins will want to join in. Kev wrote something in here about Homer Simpson, but I’m missing that email and a couple others. Homer: Heh heh heh. Ooh, yeah, right, Lisa. A wonderful, maaaaagical animal. mmmmmmmm….that looks so good! It certainly woke up the entire clan. I’m counting nine responses within an hour! I’m thinking we’ll have to use Mary’s Chicago Bacon. After all the ruckus I had to get this one out. It was inspired from Niki’s bacon grease “sandwiches” she made us eat in Antwerp over Thanksgiving. Perhaps one day she’ll share those treats with us. This one works equally well with pork or beef tenderloin. Start with a large piece of foil on the counter. a Tablespoon of Cracked Black Pepper on top. Lay your tenderloin on top and roll. 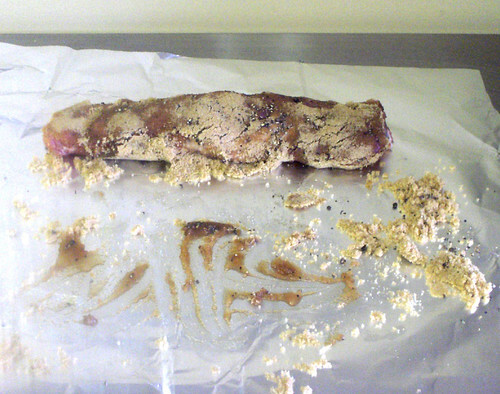 Next, Lay out your bacon slices on top of any extra brown sugar. Don’t leave too much brown sugar on if you’re going to grill because it will burn your bacon. Over lap bacon just slightly. 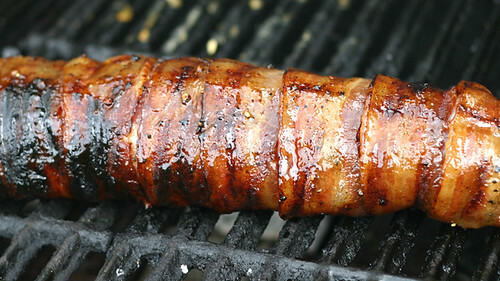 Roll the tenderloin in the bacon. You can use the foil to help you roll – just don’t roll it up into the meat. 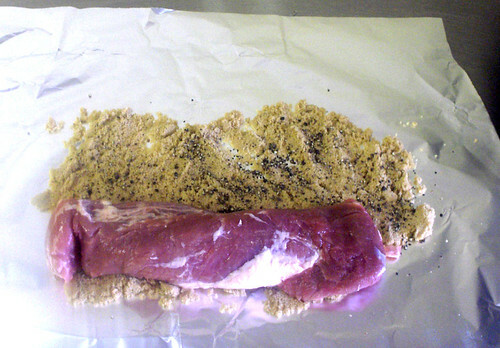 Finally – use the foil to wrap your tenderloin up an let sit for an hour or more. The second time I made this I did secure the bacon with toothpicks – but you have to warn eaters about them, because they did burn off and you couldn’t see them. Sear all three or four sides about 3-4 minutes on each side. The bacon should be almost all cooked by this point. Turn off the heat under the tenderloin, leaving the oposite side of the grill on (indirect heat) and continue to cook for another 30 minutes or until the internal temp of pork is 145 degrees. I light pink interior is what you’re looking for in pork. As for beef – cook it to your desired doneness. Another cooking option would be to broil then bake in the oven. I safer bet for non burned bacon! If you soak your toothpicks in water first they shouldn’t burn as much! This looks amazing!! Can’t wait to try it! !